Parents can feel upset and powerless when they discover their child has been bullied. As a parent it is helpful to increase your child's resilience to cope with bullying and feelings of anger and sadness.  Speak to your child’s school to create a plan to try to solve the problem.  If you feel your child's school isn't dealing with the bullying it can help to print off the school’s statement on bullying as a reference for meetings.  At home, try to support your child’s ability to express her emotions and understand other people’s emotions.  Try to get her involved in activities outside of school that will boost her self-esteem and confidence. It is very upsetting as a parent to see your child unhappy, and to feel as if you are unable to help her deal with her problems. In some circumstances, this is because your child is being bullied at school and the school has not solved it internally. In this situation it is common to feel angry and powerlessness about the situation. In these difficult times, you need to look for positive and proactive ways to approach the problem. Children who complain about being bullied are by definition vulnerable to aggression and negative behaviour and have not sufficient resilience or self-confidence to stick up for themselves or avoid conflict. As a parent try to understand what your child’s school is doing to deal with the specific problem. In addition, there are positive things you can do at home to encourage your child to develop the self-respect and determination to resist personal attacks. The theory is that more practical tasks and good role modelling with parents at home, can work to improve children’s outlook on life and their ability to cope with difficult situations with their peers at school. Here are 11 recommendations for what you can do at home to help build their self-confidence and resilience. Discuss with your partner how to develop consistency in your response to your child. Your child needs to learn to expect similar responses from the key adults in her life as this will help her feel more secure. Curb any sense of impatience or getting cross with your child as this can be very disorientating and upsetting for her. It is also a waste of time because losing one’s temper produces negative energy for everyone in the family. When adults lose their temper, children do not always understand the reasons for it. Children do not make the same associations in the brain as adults do, so it is not fair to lose your temper over issues that your child may not understand. Anger mostly creates more anger and fear – it does not create a negotiated peace. Ensure that all communications or instructions to your child are conveyed as simply as possible, broken down so that she can follow each element at a time and using visual clues and non-verbal communication. Sit down on a weekend together with your children, and plan the activities for the next month so that together you create weekly timetables which will help all of you get the chores done in the home. Pin up an agreed ‘to do’ list in the kitchen. Agree as a team with your children who will take responsibility for each of the tasks, e.g., doing the gardening, cooking, cleaning and doing homework. Try to swap responsibilities so they don’t become a chore and to show that you are not gender-biased, girls, as well as boys, can wash the car or repair punctures in bikes. Give reminders to your child so she knows when she needs to complete a task, such as ‘in fifteen minutes you will need to go and do your homework.’ Always offer support for homework and learning new skills. Try to teach your child new skills in the home, such as cooking, DIY or gardening, etc. This will build her self-confidence and give her opportunities for research and investigation, such as planning a meal, searching for recipes or finding out about the correct plants for the type of soil you have. When giving instructions be specific about what needs to be done. Also be specific if you want your child to stop doing something, such as ‘please don’t jump on the bed, jump in the garden’. Don’t say general things like ‘just stop being naughty’. Help your child to learn how to interpret and deal with emotions by depersonalising them and using someone imaginary, for instance from a story or the office. For example, you could tell a story about someone at the office who kept on crying because his dog had just died, and ask your children to help you work out how to deal and help this person. By having to put your child’s mind to an external problem about dealing with emotions, it will help her develop the knowledge and skills to deal better with emotions. Give your child lots of descriptive praise with hand and facial gestures to reinforce your excitement and pleasure. Such as, thumbs up signals, claps, and big smiles to praise e.g., food that she has cooked, or to express pleasure for the simplest things like setting the table nicely. The more praise you give your child’s particular efforts, the happier she will be. Treat your child as well and as sensitively as you would treat your colleagues at work and she will want to please you. You will build her resilience and nurture a strong attitude towards coping with life. You will give her the skills and boundaries to make effective contributions to the society in which she grows and learns. It is hard to know what is going on at school unless you speak to the adults who work directly with your child. The first point of call is to talk with your child’s teacher in a primary school or to the form tutor in a secondary or high school. They are the people who will know her most and should be able to tell you what has been going on. Indeed in some instances, it is the teachers who may have witnessed the behaviour of others in the class with your child, and will be most likely to want to share with you what has been going on. If you have already developed a good relationship with these teachers, then the issues raised may be able to be dealt with amicably, and you can share with them the ideas you have for increasing your child’s resilience and self-confidence at home. 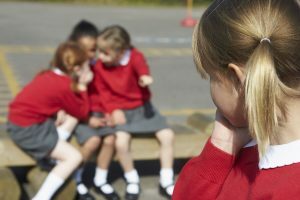 With both the school and the home working proactively to address bullying, it is more likely that she will be encouraged to resolve their difficulties or address any unacceptable behaviour. However, if circumstances are such that you are not happy with the response from the teachers directly involved with your child, it is essential that the next step is taken to bring the issue to the attention of the Headteacher. If this is required, first check the school’s website to download the published policies for supporting children’s health and well-being, and for addressing instances of bullying. These documents are scrutinised by school governors and assessed for their efficacy in Ofsted inspections in the UK, for example. They are guidelines for behaviour management to ensure that children attending the school have the best support available from staff to feel secure and happy within the confines of the school. These documents also inform parents what the school will do if children are being bullied and how the school will involve parents in seeking solutions to such health and well-being issues. It is essential to engage the headteacher at a planned meeting, armed with these documents as well as prepared information about what you believe has been going on for your child, and a list of questions and suggestions about what you would like to achieve. Be confident in the defence of yourselves and your child, and listen and respond with interest to what the headteacher has to say. You can take someone with you if you feel uncomfortable or need help with speaking English. The most important element of the meeting is to end it by agreeing on a list of objectives for the school to follow which you believe will support your child and help improve her experience and emotional well-being. Also, agree that you will continue to work with the school by supporting your child at home. It is essential that a follow-up meeting is set so that the situation in respect of the behaviour of other children and the response of the teachers concerned is monitored. Matters which have been unresolved at lower levels of the staffing structure should be sorted to your satisfaction with the leader of the school. In some cases, parents may have to approach school governors to seek suitable redress. It is really important for parents not to lose their focus or resolve. As a parent, you are an advocate for your child and you need to do all you can to support her effectively. In some cases working with institutions can be tiring and drawn out. Take courage and do what you think is best for your child.